Vijay Seshadri is the author of three collections of poetry, including 3 Sections, which was awarded the 2014 Pulitzer Prize for Poetry. His other collections of poems include James Laughlin Award-winner The Long Meadow (Graywolf Press, 2004) and Wild Kingdom (1996). His poems, essays, and reviews have appeared in AGNI, the American Scholar, Antaeus, Bomb, Boulevard, Lumina, the Nation, the New Yorker, the Paris Review, Shenandoah, Southwest Review, Threepenny Review, Verse, Western Humanities Review, Yale Review, the Times Book Review, the Philadelphia Enquirer, Bomb, San Diego Reader, and TriQuarterly, and in many anthologies, including Under 35: The New Generation of American Poets, Contours of the Heart, Staying Alive: Real Poems for Unreal Times, and Best American Poetry. Seshadri has received grants from the New York Foundation for the Arts and the National Endowment for the Arts, and has been awarded the Paris Review’s Bernard F. Conners Long Poem Prize and the MacDowell Colony’s Fellowship for Distinguished Poetic Achievement. Born in Bangalore, India, in 1954, Seshadri came to America at the age of five. He grew up in Columbus, Ohio, where his father taught chemistry at Ohio State University, and has lived in many parts of the country, including the Pacific Northwest, where he spent five years working in the fishing and logging industries, and New York’s Upper West Side, where he was a graduate student in Columbia’s Ph.D. program in Middle Eastern Languages and Literature. He holds an A.B. degree from Oberlin College and an M.F.A. from Columbia University. He currently teaches prose and nonfiction writing at Sarah Lawrence College and lives in Brooklyn with his wife and son. Vijay Seshadri is the author of three collections of poetry, including 3 Sections, which was awarded the 2014 Pulitzer Prize for Poetry. The Pulitzer Prize committee praised 3 Sections as: “a compelling collection of poems that examine human consciousness, from birth to dementia, in a voice that is by turns witty and grave, compassionate and remorseless.” His other collections include The Long Meadow, which won the James Laughlin Award, and Wild Kingdom. His poems, essays, and reviews have appeared in AGNI, the American Scholar, Antaeus, Bomb, Boulevard, Lumina, the Nation, the New Yorker, the Paris Review, Shenandoah, Southwest Review, Threepenny Review, Verse, Western Humanities Review, Yale Review, the Times Book Review, the Philadelphia Enquirer, Bomb, San Diego Reader, and TriQuarterly, and in many anthologies, including Under 35: The New Generation of American Poets, Contours of the Heart, Staying Alive: Real Poems for Unreal Times, and Best American Poetry. Winner of the Pulitzer Prize, 3 Sections is assured and expert, Seshadri’s line as canny as ever. In an array of poetic forms from the rhyming lyric to the philosophical meditation to the prose essay, 3 Sections confronts perplexing divisions of contemporary life-a wayward history, an indeterminate future, and a present condition of wanting to out-think time. 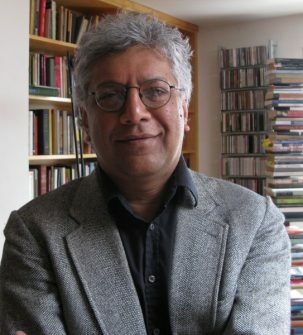 Thematically, The Long Meadow asks big questions and addresses big issues—time and consciousness, suffering and devotion—but for all their deep seriousness of purpose, Seshadri’s poems refuse to take themselves too seriously, disguising an existential disquisition on death as a Rocky and Bullwinkle episode, considering human suffering through the lens of “Superman Agonistes,” grounding a parable of divine injustice with the freedom of a dog unleashed in the Long Meadow of Brooklyn’s Prospect Park. by the creamy dunes where the plovers nest? and marry me, distorted as I am. on the Corn Laws and the constitution. They were in the scullery talking. couldn’t cross it in a day. Genevieve. Hortense. Mémé. and the foot sinks to the ankle in the muddy lane? I didn’t stay for the end of the conversation. waited to open its arms to me.